The skip-gram neural network model is actually surprisingly simple in its most basic form; I think it’s the all the little tweaks and enhancements that start to clutter the explanation. 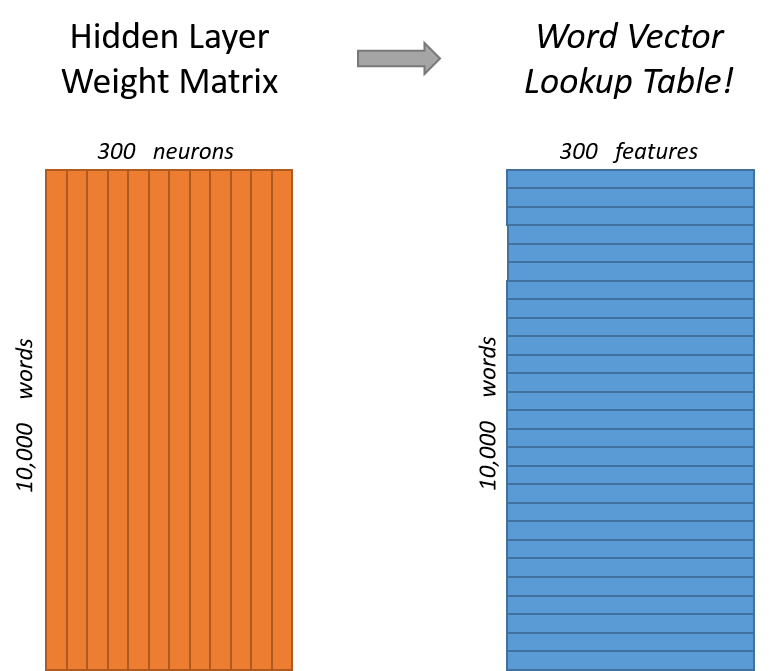 Another place you may have seen this trick is in unsupervised feature learning, where you train an auto-encoder to compress an input vector in the hidden layer, and decompress it back to the original in the output layer. After training it, you strip off the output layer (the decompression step) and just use the hidden layer — it’s a trick for learning good image features without having labeled training data. When I say “nearby”, there is actually a “window size” parameter to the algorithm. A typical window size might be 5, meaning 5 words behind and 5 words ahead (10 in total). 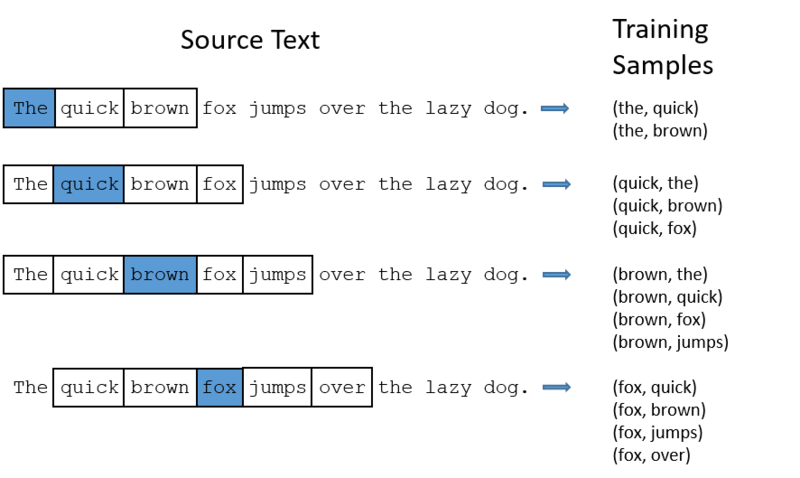 When training this network on word pairs, the input is a one-hot vector representing the input word and the training output is also a one-hot vectorrepresenting the output word. But when you evaluate the trained network on an input word, the output vector will actually be a probability distribution (i.e., a bunch of floating point values, not a one-hot vector). 300 features is what Google used in their published model trained on the Google news dataset (you can download it from here). The number of features is a “hyper parameter” that you would just have to tune to your application (that is, try different values and see what yields the best results). So the end goal of all of this is really just to learn this hidden layer weight matrix — the output layer we’ll just toss when we’re done! 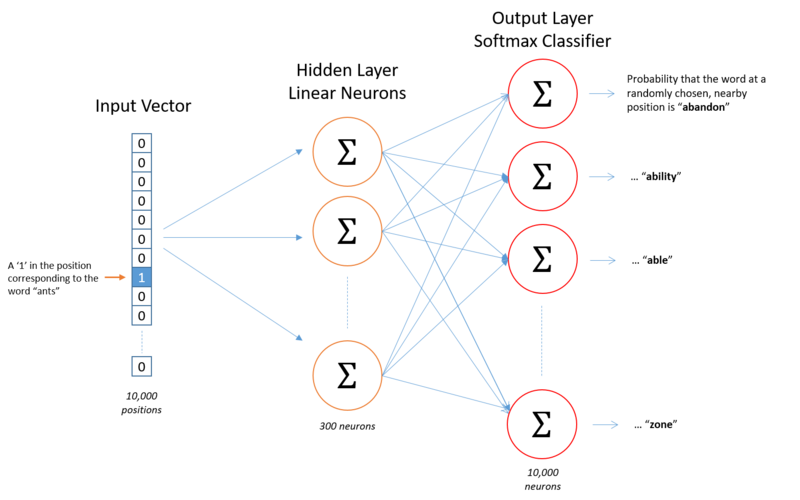 Note that neural network does not know anything about the offset of the output word relative to the input word. It does not learn a different set of probabilities for the word before the input versus the word after. To understand the implication, let’s say that in our training corpus, every single occurrence of the word ‘York’ is preceded by the word ‘New’. That is, at least according to the training data, there is a 100% probability that ‘New’ will be in the vicinity of ‘York’. However, if we take the 10 words in the vicinity of ‘York’ and randomly pick one of them, the probability of it being ‘New’ is not100%; you may have picked one of the other words in the vicinity. This can also handle stemming for you — the network will likely learn similar word vectors for the words “ant” and “ants” because these should have similar contexts.